If you rely on encrypted services to keep your data private and, unfortunately, you are in China, then you are about to be worried. As of now Chinese government could snoop into the operations of technology companies as well as circumvent privacy protections in everyday gadgets. China passed its controversial new anti-terrorism law on Sunday that requires tech companies to help decrypt information or hand over encryption keys to officials when they want to spy on someone's communication in order to counter terror operations. However, the officials swear that the law wouldn't require technology firms to install "backdoors" in their products, but it doesn't make any difference when the government mandate companies operating in China to provide encryption keys and passwords when requested. Just like recent proposals from the intelligence agencies in the UK and US after the deadly assaults in Paris and California, China claims such law is necessary to fight against terrorism. "Nowadays, the Internet is increasingly used by terror groups to spread their extremist ideas, recruit fighters, channel fund and plot attacks," said Xinhua, China's official news agency. However, critics are worried that the so-called anti-terrorism law could give the Chinese government right to snoop into the operations of major tech companies and ways to circumvent encryption protections in everyday gadgets, including smartphones, home routers and Smart devices. Earlier this year, President Barack Obama raised his concerns over the then-draft law with China's President Xi Jinping, saying that the law would amount to a dangerous "back doors" to internet companies. 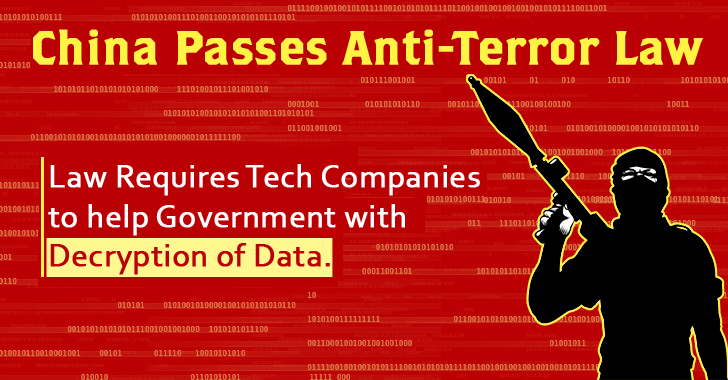 However, the government official assured that this law is meant to fight terrorism, so it will neither affect the normal operation of technology companies nor install any "backdoors" to infringe intellectual property rights or freedom of speech of every citizen on the Internet. The country's first anti-terrorism law goes into effect on January 1st. But, despite the requirements set out by the new law, major tech firms, such as iPhone maker Apple, do not hold the encryption keys, making itself incapable of providing access to users' data even if requested by the government. That sets up a potential conflict. So what will happen if Chinese authorities order these technology companies to fork over encryption keys that they can not possibly deliver? Would they ban such companies from the country? Would they fine those companies to pay an enormous amount? Just like US government imposed $5,000 per day fine on Lavabit founder for refusing to turn over the encryption keys. But always keep in mind that no matter what, there would be many companies that will sacrifice your privacy in order to continue operating their business in the world's most populous nation.